LetsPhysics.COM: Why 'e' is a Universal Constant - 2.718 ? Why 'e' is a Universal Constant - 2.718 ? 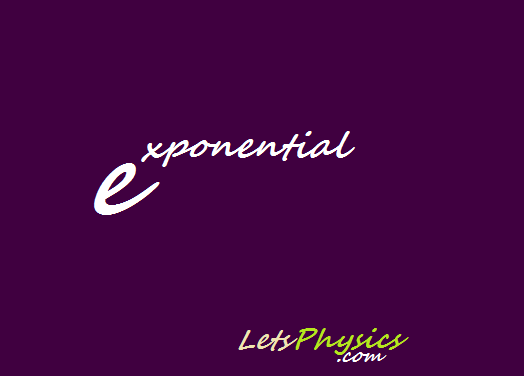 Exponential is a mathematical term,which indicates the variation of anything in terms of the exponential constant - e. Whenever something gets increased or gets reduced in terms of 2.718 times,we call it exponential. The e represent the scale of growth of such an exponential action. In the physical world,we can see things grows and dies. Mostly living things,or running phenomenon's. Nature have a policy of growth. We don't know why; may be because that's easier,faster and comfortable. The term exponential refers to such a growth. So How do we interpret e? Before interpreting e and exponential growth,lets examine how things multiply. How do nature multiplies things? We know, the easier and simplest multiplication is doubling. Nature too ,depends on it. 1 become 2,2 become 4,4 become 8 and so on. Mathematically we can represent this in terms of 2's power or 2's multiples. Then what Is the need of exponent? We already said, exponential means growth/multiplying. So,lets consider this 2*2*2*2*2...as the growing rate. But from Where did we got this 2? So,in the beginning there was 1,it multiplied into 2. Which means,the multiplication was 100%. Initial condition is the whatever amount we had. If we wanna double; the finalizing condition is a 1. If we only wanted to increase the growth by a small percentage, the value of 1 reduces up to 0, or becomes larger when we want a big growth. A negative growth is nothing but decay. So,try drawing a flow chart. 1 becomes 2,2 becomes 4 and so on. The interesting twisting fact is that, at the beginning the responsibility of growth was with the 1. 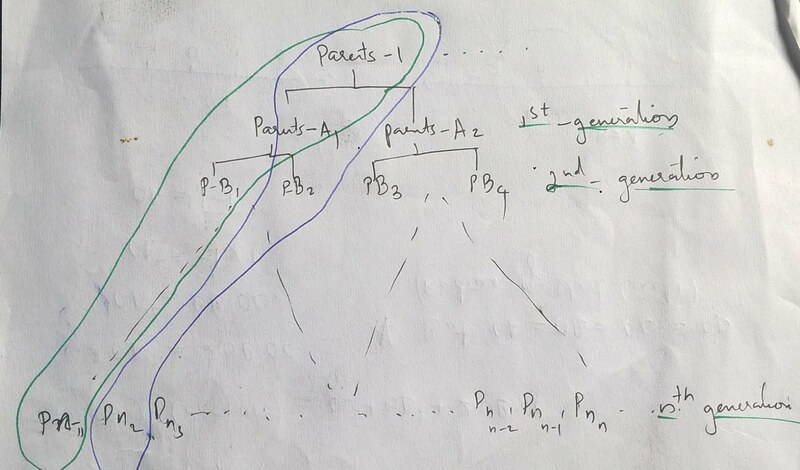 In the next step the growth,which is at a constant rate,became the responsibility of 2. This two divides the responsibility and creates another 2-the new 4. So totally the responsibility of growth resides now with 4. To easily visualize this, consider a family. Parents give birth two 2 children. The responsibility of family now resides within the two children. Who will marry, give birth to 2 each. The total 4 children again marries and give birth to 8. The only difference here is no marriage is taking pace. Now remember, initially the first grandfather had the responsibility to start his family. Only him can - 100%. Next the two children had the equal responsibility to grow the family 50% and 50%. 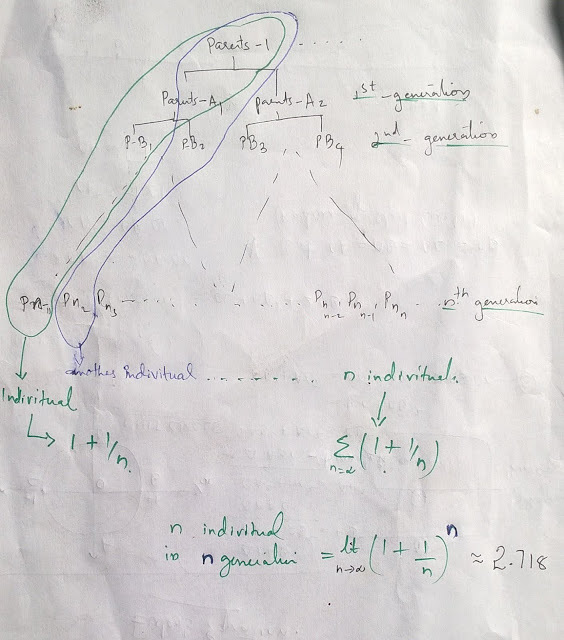 Generation by generation, it becomes - 25%,25%,25%,25%. Then next generation will be 12.5%,12.5%,12.5%,12.5%,12.5%,12.5%,12.5% ,12.5% and so on. The responsibility of each generation reduces,but the growth rate of family is equal ,if we consider the whole members of each generation. Now we can consider our doubling equation. We take the 2^x equation,and substitute (1 + 1/n) to get the individual growth sequence. Pi is actually the ratio between circumference and diameter of a circle,while e is the constant growth factor of nature. Now we know,what is e.
what is the application of e? what is the physical meaning of e intuitively? what is the significance of e? where all we can find e? How is e related to logarithm?